In 2015 the ILETC project commissioned a pilot project to better understand the process of achieving change in mindframes. 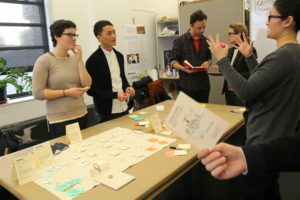 The research was conducted by students within a graduate studio ‘Transforming mindsets’ as part of a Master of Fine Arts in Transdisciplinary Design at the Parsons School of Design, New York, supervised by Professor Lisa Grocott (formerly of Parson, now at Monash University). The project used a design research approach to develop a professional development tool to explore what teachers felt was most important about their teaching practice and what stops them from pursuing this. It focused on the early stages of the process of behavioral change by providing a personal lived experience that encourages curiosity and willingness to consider new possibilities. 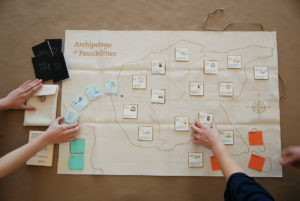 The project achieved this through the metaphor of travel – in a game called Archipelago of Possibilities. The project found that the experience allowed self-reflection, imagination, unselfconscious creativity, in-depth discussions and empowered participants to confront personal ‘road blocks’ to change. The full report is available here. 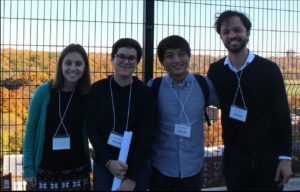 We would like to thank the Archipelago team, Isabella Brandalise, Sophie Riendeau, Ker Thao & Ricardo Goncalves, their supervisor Prof. Lisa Grocott and report author Kate McEntee.